Perhaps because of unrealistic expectations such as completely pain-free drug injections, and also due to their R&D challenges, no microneedle products have yet reached the market. Now, with the first microneedle devices for drug delivery breaking through into the later stages of clinical trials  , companies are coming around to the real and unique advantages of these systems. We explore the high potential of microneedle systems in relation to current trends in healthcare. Exploiting this potential to enable blockbuster applications depends on the creation of well-implemented microneedle systems. In the second part of the article, we draw on our experience in microfluidic medical device development to outline key R&D challenges for microneedle patches and applicators. Finally, we look at what the future of microneedle systems may hold by combining drug delivery with multiplex biomarker monitoring. 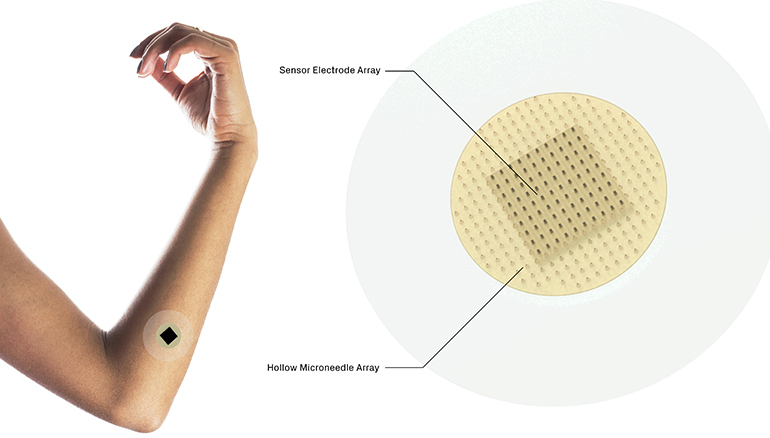 Artist’s impression of a future microneedle patch combining hollow microneedles for drug delivery and silicon microneedles for multiplexed biomarker sensing. Microneedle systems could enable the delivery of novel drugs to otherwise difficult to reach organ sites. Microneedle patches could, for example, provide a shortcut to the intradermal capillaries of the lymphatic system, enabling better targeting of conditions such as metastatic melanoma. Another novel drug delivery system may involve suprachoroidal injections , offering – for some drugs – a safer, more efficient path to deliver drugs to the posterior eye segment (e.g. the retina) than intravitreal delivery. At the same time, microneedle patches can be designed for a wide range of pharmacokinetics: from faster than oral administration to sustained delivery over a day. This opens up new opportunities in areas such as migraine and pain relief. In addition, microneedle arrays could simultaneously and accurately detect multiple biomarkers or metabolites, such as glucose, lactate and other key physiological indicators. Microneedle-empowered sensors can access the interstitial fluid, where many molecular biomarkers are present at similar levels as in blood. By comparison to single-point measurements, a multiplexed array of contact points and sensors could obtain multi-analyte measurements and thus provide a “holistic” understanding of the metabolism . This could redefine what is possible in the field of advanced patient monitoring and personalised drug delivery. Despite early excitement around painless patch application thanks to much smaller needle size alone, reducing injection pain may not be as easily achievable as expected after all. However, patches with very small and, in some cases, barely visible needles offer the promise of overcoming needle phobia and reducing pain when compared to more traditional injectors. As well as improving the user experience, well-designed microneedle systems could improve the ability of some patient groups to self-administer the patches and increase medication adherence . In contrast to more mature technologies, microneedle systems still pose multidisciplinary R&D challenges that must be addressed to realise opportunities for drug delivery and multiplex biomarker detection. Microneedle penetration depth and adhesion consistency must be guaranteed by a well-engineered application method and patch combination based on in-depth understanding of skin biomechanics. For example, the skin’s anisotropic properties present an opportunity to improve penetration consistency by choosing the optimal direction of forces during patch application. Penetration characteristics are also interrelated with the applicator design and its usability. Unless the microneedle patch is optimised with this in mind, the device will likely become larger and less user-friendly. The challenge of application consistency is complex, multidisciplinary and multi-objective, therefore requiring R&D approaches to match. Importantly, R&D should address the key contributing features of the applicator-patch combination to microneedle performance variability. Unless patients are put at the centre of product developments, there is a risk that microneedle systems will make the user experience worse. The impact velocity and forces required for consistent and reliable penetration even into the upper layers of the skin can be high and could potentially exacerbate pain. System optimisation can help reduce these physical factors, but other aspects of the application process – such as holding skin tight, dampening impact sounds – are also critical in helping to ensure this experience does not become a barrier to use. Likewise, incorporating patient psychology into the design can have a significant impact on pain perception. Careful design of packaging information, unboxing experience, and any set-up steps can help reduce anticipation or perception of pain. During application, distraction techniques and positive feedback may also help. Finally, applicators are generally re-usable and require additional use steps (e.g. to prime, load, fire, and remove the microneedle patch) when compared to disposable autoinjectors or pre-filled syringes. Minimising steps, maximising usability and convenience are therefore also critical for a positive user experience. Successful drug delivery can be difficult with both hollow and solid microneedles. Unless well devised, the former can suffer from leaks through the ‘weakest link’, e.g. the 1% of needles that have failed to penetrate the skin or offer a low‑resistance path for leakage. For solid, coated microneedles, a key challenge is achieving a consistent needle coating with the drug formulation. This must remain adhered during storage and deployment, not present a barrier to skin penetration, and then allow for appropriate diffusion whilst embedded. At the scale of typical microneedles, capillary forces dominate in traditional deposition processes such as dip coating, so alternatives such as well-controlled spray technologies may offer advantages in deposition control. Of course, there are many other options, including microneedles composed entirely of the drug product, which dissolves and diffuses transdermally upon insertion. Balancing microfabrication scale-up robustness and product cost of goods (COG) requires careful consideration from the early phases of combination product R&D. Specifically, not only the ability to generate the micrometre-scale features, but also the tight tolerances achieved with advanced manufacturing techniques require balancing with their trade-offs: namely, higher costs and more complex scalability. State-of-the-art silicon microfabrication, for instance, offers unique advantages when integrating semiconductor sensor technologies and other actuators. But when the goal is achieving tight tolerances, for example to create a precise outlet feature in a hollow microneedle, laser micromachining and other processes offer lower COG and easier scale-up. Healthcare systems and patients increasingly make use of additional sensor data to monitor conditions and personalise treatments. The industry is also focussing on adherence to treatment as a key driver of improved health outcomes. And novel biologic drugs require different drug delivery systems for maximum effectiveness. Microneedle technology offers exciting prospects in all these areas, with the potential to transform patient outcomes. Based on experience with microfluidic medical devices, we suggest that successful microneedle system development requires focus on application consistency, consideration of the user experience, and fine choice of fabrication technology for micron-scaled components. 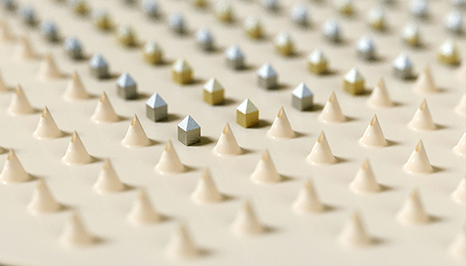 Drug delivery microneedles, both hollow and solid, present specific challenges too. Solutions to all these constraints typically entail complex trade-offs based on in-depth understanding of the physics, biology, skin biomechanics and engineering options at play. Looking forward, we expect to see growth, first, in drug-delivery-only devices, starting with those already in late-stage clinical trials. These systems will likely be followed by sensor-only systems capable of making robust multi-analyte measurements through an array of contact points. The development of these systems will be driven by growing demand for monitoring both specific conditions and general health. In the context of a developing digital health ecosystem and increased focus on patients, “holistic sensors” could provide decisive feedback loops for value-based healthcare. And further ahead, we expect to see integrated sensor and drug delivery systems that support the personalisation of treatment regime in response to the relevant biomarker measurements. Top image: Microneedle patch comprising sensor electrode array and hollow microneedle array for personalised drug delivery. Arnau Perdigó Oliveras is a consultant at TTP with experience in leading multidisciplinary teams in complex medical device development. This has included products involving microfluidic applications that required advanced manufacturing techniques such as laser micromachining and silicon microfabrication. He is further interested in the application of new technologies such as Artificial Intelligence in medical devices to improve health outcomes.